Shelving to increase productivity. 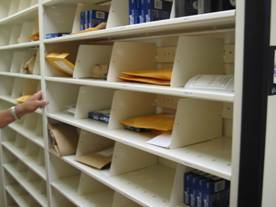 When speedy and accurate shelving is critical, the convenient open shelf design of 4 post shelving enables users to store and retrieve files with ease. 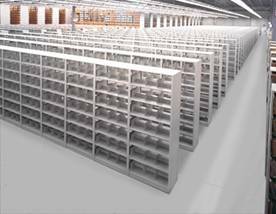 Allowing maximum visibility and accessibility, 4 post shelving speeds up filing time and minimizes misfiling. Let Spacesaver of Memphis assist you with your shelving needs. Modular and flexible shelving that is recommended for small to large systems with high activity, low cost 4 post shelving adjusts to the changing demands of your organization’s storage and record-keeping requirements. 4 post shelving literally snaps together in minutes for quick installation, easy expansion or reconfiguration of your shelving system. 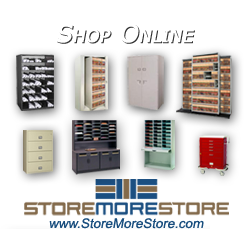 File shelving, library shelving, box shelving, parts shelving. 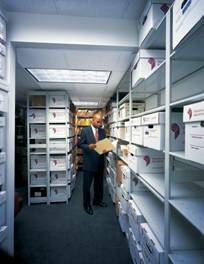 Let our team in Memphis serve you with your shelving requirements. Shelving that is mobile ready. Spacesaver 4 post shelving is available as stationary static shelving units or can be added to a High Density Mobile Shelving or Lateral Mobile Shelving system for even greater space utilization. 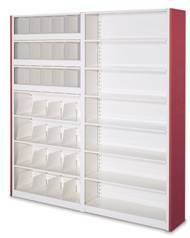 Box shelving storage systems for all sizes of boxes. Systems like this are available on Texas StateContract (TXMAS) , U.S Communities Contract, GSA Contract , Healthcare Group Purchasing Contracts, Kansas StateContract, and many more.